The law firm of Bowers, Brewer, Garrett & Wiley, LLP is a general practice law firm serving clients in Huntington County since 1899. Current members include David L. Brewer, Robert S. Garrett, Joseph K. Wiley, Mark J. Wiley and Haley D. Spafford. The firm’s association with Huntington began in the fall of 1899 when Fred H. Bowers came to Huntington and formed a partnership with Cary D. Landis. Upon graduating from law school in 1899, Mr. Bowers was admitted to practice law in Fort Wayne, but soon moved to Huntington to establish his practice. Milo N. Feightner returned to Huntington in 1900 and “read law” in the offices of two distinguished lawyers who both later became Judges. Milo Feightner and Fred Bowers formed the partnership of Bowers & Feightner in 1904. They remained law partners until Mr. Bowers’ death in 1937. During that time, Mr. Feightner served as Mayor of the City of Huntington between 1910 and 1914, and served as President of the Indiana State Bar Association. Mr. Feightner continued to practice law in Huntington until his death in 1945. Fred Bowers’ oldest son, Lee M. Bowers, joined the partnership in 1920 after having graduated from Indiana University School of Law. Lee Bowers became a fellow in the American College of Trial Lawyers in 1962 and was well known for his reputation for bombastic courtroom arguments. Lee Bowers continued to practice law in Huntington until his death in 1964. Arthur J. Palmer obtained his law degree from Indiana University in 1931 and joined the firm in 1932. Mr. Palmer continued practice with the firm, becoming Senior Partner in 1965, until his retirement on January 1, 1986. During his practice, Mr. Palmer served as Prosecuting Attorney from 1933-1934, County Attorney from 1936-1937, and City Attorney from 1956-1957 and from 1961-1968. Following in the foot steps of his father and grandfather, James W. Bowers joined the firm of Bowers, Feightner & Palmer in 1953 after earning his law degree from Indiana University. James Bowers served as Prosecuting Attorney from 1959 until 1966. He was active in the local bar and the Indiana State Bar, where he served as Treasurer from 1982-1983, and on the Board of Managers from 1989 to 1993. Mr. Bowers continued to practice law in Huntington until his death on May 1, 2003. From Bowers & Landis in the beginning of the century to Bowers, Brewer, Garrett & Wiley, LLP today, these associations of lawyers have served the needs of the Huntington Community, not just through providing quality legal services, but through a dedication to the community and volunteer service to its many beneficial organizations. 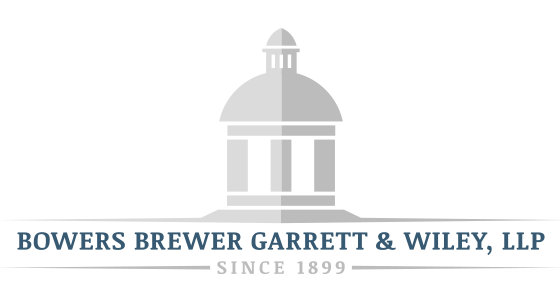 The current members of the firm of Bowers, Brewer, Garrett & Wiley, LLP are proud to carry on the tradition of their predecessors and ancestors.